Stumpwork embroidery - raising your game! I first heard of Stumpwork embroidery in the late 1980s which happened to be perfect timing! With a toddler around I had sadly put away my bobbin lace pillow for fear that he would pull out the pins and tangle my bobbins. Needlelace, a technique used in stumpwork, allowed me to continue my lacemaking, albeit in a different form. Of course, it also incorporated my love of embroidery in all its many forms. 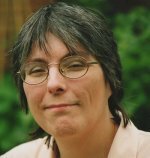 I was lucky enough to attend a needlelace workshop with Kay Dennis around that time, and her passion for the technique encouraged me to take it further. I had the basic embroidery skills already, and watching someone else create the lace helped me to correct the tension of my detached buttonhole stitches. When it was popular in the 17th Century, this form of needlework was known as Raised Embroidery, which is perhaps a little more descriptive than its current name. There are numerous ways of creating the raised elements of a stumpwork design. Let's take a look at each of these in turn. One or more layers of stitches, worked in alternate directions, acts as a padded base under a motif. I did this with the cream cotton thread in the photo below. I worked only half the motif, as a demonstration, and built up three layers in the center. 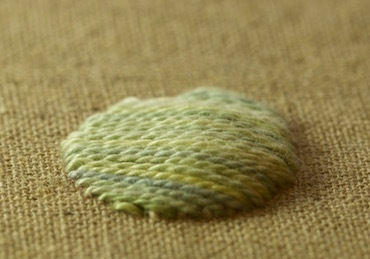 I then satin stitched the whole shape in green hand-dyed thread over the top. 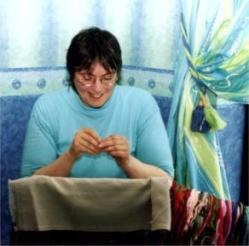 The second photo shows how the padded side rises above the surface of the fabric. If I had padded the whole area, the result would have appeared domed. Ideal for a flower center perhaps? You can also use felt to raise your stitching off the surface fabric. Trace the shape to be stitched onto felt and cut it out. Then cut two successively smaller pieces. Match the felt color to that of your embroidery thread to eliminate the chance of it showing through your stitching. 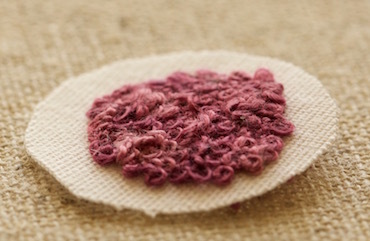 Attach the felt shapes to your project with tiny stitches around the edge, starting with the smallest piece. The center will then have more depth than the edges. Work your embroidery over the top of the felt. I used this method for the bunny's head and basket pictured in Figures 4 and 5. 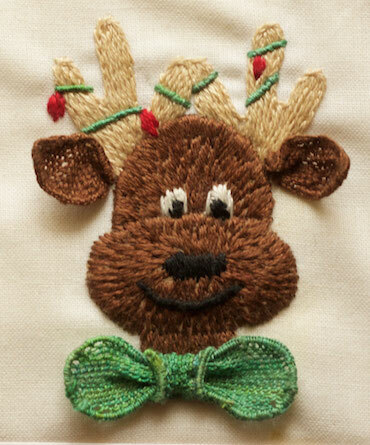 Various stitches can be employed to add a 3D effect to your stumpwork embroidery. 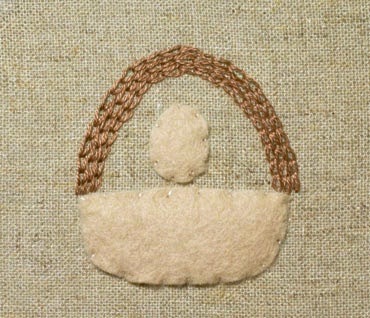 These include knotted, woven, detached and couched stitches. Some stitch names even give you a hint, like raised fishbone. raised buttonhole flowers or velvet stitch. The photos below show raised stem band.. The first step here is to place regularly spaced, straight stitches across the width of a shape, and then work rows of stem stitch by slipping the needle under each "bar" in turn, without going through the fabric. 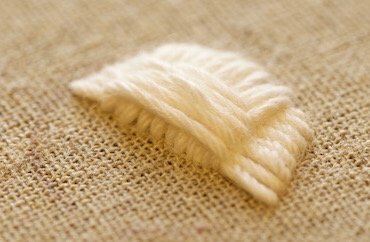 If you require further height, you can lay padding threads under the horizontal stitches before working the stem stitch. 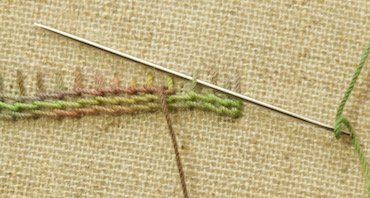 Detached stitches come into their own, when doing stumpwork embroidery. 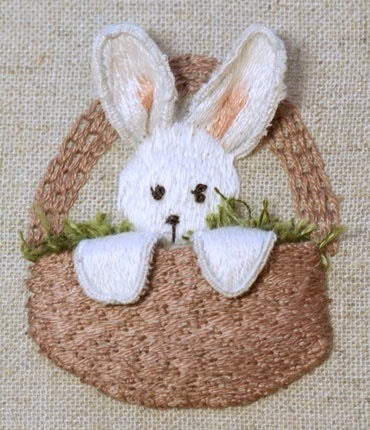 One of my favorites is the needlewoven picot., which I used in my bunny tutorial..
For this technique, the embroidery is done on a separate piece of fabric or canvas, known as a slip. 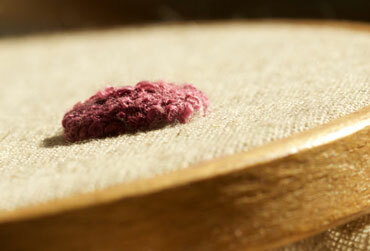 In the sample here I used French knots which give a slightly raised appearance by themselves. I then cut out the stitched shape, leaving a small amount of extra cloth around the outside. I turned the raw edges to the back before attaching it to my main fabric. To give a little extra dimension, I tucked some soft cotton thread underneath. If additional shaping is needed, couch wire along the edge of the piece. Buttonhole over this wire and then fill the area with your chosen stitch. I used long and short stitch for the sample shown in Fig 11. Cut around the shape, close to the edge, when completed. You will often find flower petals and leaves handled in this manner in stumpwork embroidery designs. 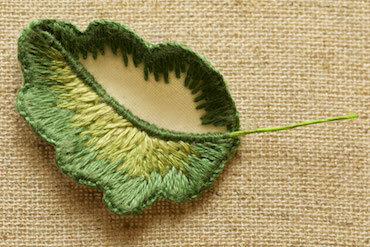 For leaves you can also add a wire vein. If your design has a background of flat embroidery, do that first. Then attach the raised and freestanding pieces, leaving those closest to the viewer until last. The sections closest to the viewer will then overlap those further back and look more natural. One of the main advantages of using needlelace is that it doesn't fray, so it isn't necessary to turn under the edge. You will need to make up a needlelace pad on which to work. This pad consists of three layers of fabric, a paper pattern and a covering of sticky backed plastic. Only the stitches holding a couched thread (or wire) around the outside go through all layers. 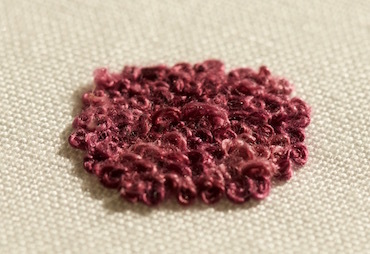 The rest of the stitches loop under and through existing stitches to form a separate lacy fabric. Once completed, snip the stitches that hold your work to the backing to release the lace. The lace can then be attached to your project, often draped over a padded area. It is ideal as clothing for mini figures. 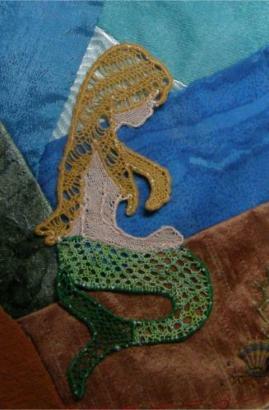 I used my little mermaid figure on a crazy quilt block, which sadly went out for a "Round Robin" and never returned to me. You might like to try my beginners heart or the little daffodil if you want to try needle lace for yourself. Read more information on the history of this type of lace.